Software ONE Inc., based in New Berlin, Wis., is a Microsoft Gold Certified Partner and Large Account Reseller, and is a specialist in software licensing. Its VARassist program allows VARs and solution providers to offer Microsoft volume licensing services to small and midsize business (SMB) customers. Softwarepipeline, based in Switzerland, provides value-added services around license management, security management and infrastructure management. The company is a Microsoft Gold Certified Partner in security, licensing, software asset management, infrastructure and business solutions. Softwarepipeline acquired a stake in Software ONE in June, and the two companies have now merged their operations. 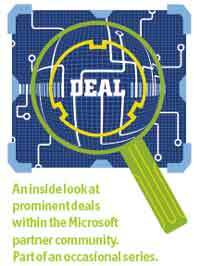 The companies, both privately held, did not disclose terms of the deal. Patrick Winter, Softwarepipeline's CEO of international business strategy and development, is now worldwide CEO for the combined organization. Software ONE's leadership team, headed by CEO Michael Quinn, is unchanged. Together, the two companies have 120 employees. Software ONE continues to do business under its current name; it has retained all its U.S. employees and plans to add more as the merged company grows. Software ONE's U.S. sales totaled $44 million in 2005, and officials expect 85 percent growth for 2006. Executives from both companies say they expect $220 to $250 million in revenues for the combined organization this year. the seeds of which were planted when Softwarepipeline executives looked into adopting the name Software ONE for part of the company's operations in Europe and discovered that a U.S. company was already using it, Winter says. He says he was interested in merging with Software ONE after looking more closely at its VARassist program. Quinn says Software ONE needed to address a growing number of global customers in the midmarket space. Lee Pender is Redmond Channel Partner magazine's senior editor. You can reach him at lpender@rcpmag.com.